Transferring from a wheelchair to the toilet can be an overwhelming experience for many frail or disabled users. The installation of the Pressalit Care height adjustable Select toilet bracket can make the world of difference, not just from a practical and safety point of view, but importantly in retaining the dignity and independence of the user. To meet with the requirements of the British Standard, toilets installed in bathrooms used by those with disabilities should be at the same height as a standard wheelchair, to limit the risk of falls. With the ability to raise or lower the toilet however, ease of transfer can be aided even more with the assistance of gravity. With the use of a hand-held control, the toilet pan can be adjusted to slightly below the level of the wheelchair, thus helping transfer across. To move back, simply raise the toilet back to a height slightly higher than the wheelchair. 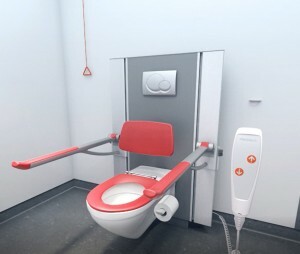 Andrew Lowndes, UK Sales Manager for Pressalit Care observes, “If you transfer from a wheelchair to a toilet higher than your sitting position, you would need significant upper body strength to transfer across and pull yourself up. The risk of losing balance and falling, or the wheelchair toppling over, is also great. The Pressalit Care Select toilet bracket, designed in a choice of contemporary colours to complement bathroom decor, features smooth lines and surfaces, with minimal slits and grooves, for ease of cleaning. Available in both electric and manual lifting options, the brackets allows for an adjustment of 300mm with the manual version, and 400mm with the electric version. The electric hand control is operated with the simple press of a button, and is ideal for multi-user bathrooms where frequent height adjustment is required. The manual option is operated by means of an easily accessible handle which can be mounted on either side of the toilet, and is the preferred option for bathrooms where periodic adjustment is the norm. The Select toilet bracket can be used alongside the Select height adjustable basin bracket; integrated into the Pressalit Care Plus system, which features a horizontal track for additional flexibility; or can just as easily stand alone as a one-off installation. Colour coordinated with anthracite, lime green or white brackets, optional coordinating hinge support arms can also be fitted.